Separate egg, put the egg whites cold. Flour, sugar, butter in pieces, egg yolks, ginger, syrup, mixed spice and baking soda in a large bowl and knead with the dough hook of the hand mixer. Then onto a lightly floured work surface and give to a smooth dough on. In clear plastic wrap and place at least two days cold. Preheat oven to 175 ° C. Conventional and line two baking sheets with parchment paper. A portion (about 1/4) of the dough and roll out to take on a lightly floured surface about 2mm thin. Cookies with different shapes cut out and arrange them on the baking sheets. Succession in a hot oven about 10-12 minutes. And remove to cool on a wire rack. With the rest of the dough the same way. For decorating the egg white with the lemon juice to beat. Gradually add the sugar, continue to beat it. 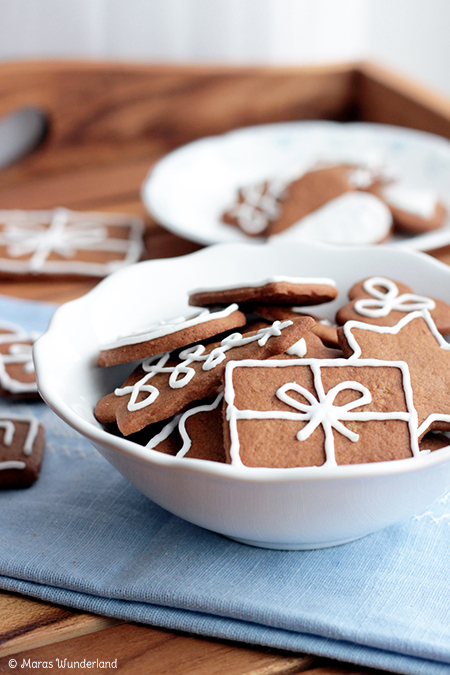 Fill the cast into a piping bag with a small Lochtülle and decorate the cookies with it. Allow to dry thoroughly. The Gingerbread keeps in a tin can 3 - 4 weeks.